Oakland’s own Fantastic Negrito is now 2 for 2 when it comes to Grammy wins. His sophomore album Please Don’t Be Dead won for ‘Best Contemporary Blues Album’. His debut album Last Days of Oakland snagged the Grammy in 2017 in the same category. 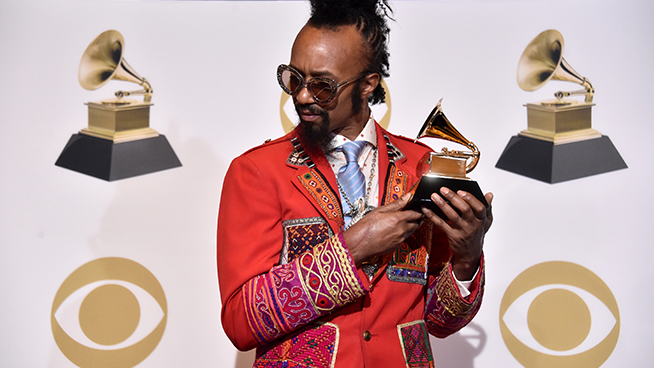 Wearing a bright red suit and a braided mohawk, the always charismatic Fantastic Negrito gave praise to his hometown during his acceptance speech and tipped his cap to the Grammy Association for recognizing his outside-the-box musical style. KFOG got lucky back in 2017 when Fantastic Negrito allowed us into his art gallery/studio to shoot a behind-the-scenes documentary on the recording process of Please Don’t Be Dead. Over the months that followed we got a chance to be a fly on the wall as he worked his unorthodox magic in the studio crafting an album that would eventually be immortalized with a Grammy. Check out the full series Behind the Record: Fantastic Negrito below.